Izmir, historically Smyrna, is the third most populous city of Turkey and the country’s largest port after Istanbul. It is located in the Gulf of Izmir, by the Aegean Sea. It is the capital of Izmir Province. The city of Izmir is composed of 9 metropolitan districts. These are Balçova, Bornova, Buca, Çigli, Gaziemir, Güzelbahçe, Karsiyaka, Konak, and Narlidere. Each district, and generally the neighborhoods within it, possesses distinct features and a particular temperament. The population of this urban zone is around 3,5 million. Izmir is the inheritor of almost 3,500 years of urban past, and possibly up to that much more in terms of advanced human settlement patterns. It is Turkey’s first port for exports and its free zone, a Turkish – U.S. joint-venture established in 1990, is the leader among the twenty that Turkey counts. Its workforce, and particularly its rising class of young professionals, concentrated either in the city or in its immediate vicinity (such as in Manisa), and under either larger companies or SME’s, affirm their name in an increasingly wider global scale and intensity. Izmir is widely regarded as one of the most liberal Turkish cities in terms of values, ideology, lifestyle, dynamism and gender roles. It is a stronghold of the Republican People’s Party. The city hosts an international arts festival during June and July, and the Izmir International Fair, one among the city’s many fair and exhibition events, is held in the beginning of September every year. It is served by national and international flights through Adnan Menderes Airport and there is a modern rapid transit line running Southwest to Northeast. Izmir hosted the Mediterranean Games in 1971 and the World University Games (Universiade) in 2005. It currently has a running bid submitted to the BIE to host the Universal Expo 2015, which will be voted on in 2008. 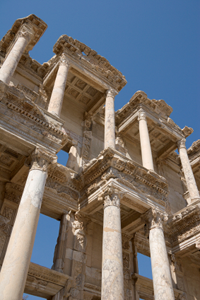 Modern Izmir also incorporates the nearby ancient cities of Ephesus, Pergamon, Sardis and Klazomenai, and centers of international tourism such as Kusadasi, Çesme and Foça. Despite its advantageous location and its heritage, until recently Izmir has suffered, as one author puts it, from a “sketchy understanding” in the eyes of outsiders. When the Ottomans took over Izmir in the 15th century they did not inherit compelling historical memories, unlike the two other keys of the trade network, namely Istanbul and Aleppo. 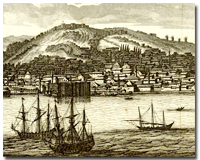 Despite the Turkish preponderance in Izmir’s population, its emergence as a major international port as of the 17th century was largely a result of the attraction it exercised over foreigners, who in their turn drew in others. Very different people found Izmir attractive over the ages and the city has always been governed by fresh inspirations, including for the very location of its center, and is quick to adopt novelties and projects. Nevertheless, its successful completion of the 2005 Universiade games gave its inhabitants a renewed confidence in themselves, which remains very present in the bid made for Universal Expo 2015.